Ernesto Diaz-Infante/Rotcod Zzaj/Eric Wallack - "The Old Neighborhood"
The Old Neighborhood brings together three ubiquitous players on the free-improv scene to create an urban themed set of music, much of which is played against field recordings of the daily activities of the city. Ernesto Diaz-Infante contributes guitar, bass, vox, drum machine and the field recordings, Rotcod Zzaj brings along his magical keys, and Eric Wallack plays acoustic guitar. "Good Morning Urbania" and "Radio Days" consists of peaceful melodies that have a hint of percussion, along with ocean waves washing up on the shore and acoustic guitar jamming along with the keys. One of the nice things about projects Zzaj is involved with is you get all the challenging experimental pieces but with just the right blend of melody and groove. "Collection Day" and "Asphaltia" include the strongest trademark Zzaj groove elements. On "Pounding, Scraping", field recordings of the hustle and bustle of the city form the backdrop for the keys, percussion and strings, all played at the busy pace that one would expect to accompany an urban motif. The musicians run circles around a single theme for 23 minutes, finding as many variations on this one thought as possible, which gave me the feeling of racing through the heavy traffic of New York or some such city... at all times feeling the impatience, anxiety, frustration and, of course, the chaos. "The Old Neighborhood" is similar to "Pounding, Scraping" in terms of chaos, but the directions the music takes are far more varied. There's a strange jazzy avant-garde chamber ensemble feel at times that I really enjoyed, and the piece plays out its last minutes as a raw, thudding blend of avant-garde garage rock and jazz. A nice set with lots of subtlties that only reveal themselves with repeated listens. 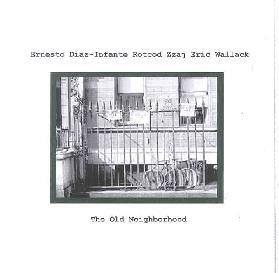 The Old Neighorhood is available for $8 from Eric Wallack; 445 North Main St; Bowling Green, OH 43402. Visit the Pax Recordings web site at: http://www.paxrecordings.com. Visit the Zzaj Productions web site at: http://home.comcast.net/~rotcod.